A conservation expedition to a remote area of Paraguay poses a risk to isolated tribal groups, according to an indigenous peoples' protection group. Scientists from London's Natural History Museum (NHM) aim to record biodiversity in the Dry Chaco region. An open letter from Iniciativa Amotocodie (IA) to the NHM has highlighted a dilemma: how to balance the need for research against the risks of disturbing indigenous communities. IA says the trip should be called off. But the museum, which is collaborating with Paraguayan colleagues in the project, said it was taking measures to ensure that the expedition would not threaten indigenous tribes. A museum press statement said: "We always take advice on these issues from the relevant national authorities, as we are doing in Paraguay." The Dry Chaco, a semi-arid lowland area that stretches into Argentina, Bolivia and Brazil, is one of the few places where there are still isolated groups of Ayoreo people. These tribes have never had contact with the outside world. The team of British and Paraguayan biologists and botanists hope to find undiscovered species of plants, insects and animals in the region. They hope the expedition will help to draw attention to the need to protect the habitat, which is under threat from the expansion of logging and intensive agriculture. But Benno Glauser, director of Iniciativa Amotocodie, told BBC News that any contact with tribal groups during the trip could have "fatal consequences". He said there was a risk of "surprise contact" because the scientists had to "move around in a very silent way in order to observe animals". Mr Glauser told the BBC's Today Programme: "We know of three isolated indigenous groups in the area targeted by the expedition. "They live in completely virgin forest... it makes them vulnerable to any external intrusion." The letter has highlighted the risks associated with carrying out research in such remote regions. Professor Richard Lane, head of science at the Natural History Museum, told BBC News: "We've considered the whole expedition from the very beginning. "We have sought local advice from our guides to ensure there will be no inappropriate contact." The team has also collaborated with Ayoreo representatives in the form of the National Union for the Ayoreo in Paraguay (UNAP). "Most recently, our collaborators have enlisted an Ayoreo elder, who has volunteered to guide our team in the forest," Professor Lane added. The charity Survival International has joined the debate. But Jonathan Mazower, advocacy director for Survival, said that the tribes often perceived outsiders as hostile, and any unexpected encounters could turn violent. But he did not suggest the trip should be abandoned. Instead, he said it should be moved to a different part of the Chaco. "[It] is a vast area, but this expedition plans to go to an area that, despite being very remote, is known to be the ancestral home of the Ayoreo tribe," he told BBC News. There are about 5,000 Ayoreo people in total. 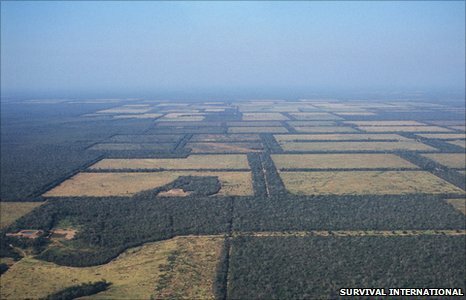 Survival International estimates that just 200 are still "uncontacted". Mr Mazower said that these people were "permanently on the run" from cattle ranchers that were clearing the forest. "Previously, when they have been contacted, there have been violent encounters," he told BBC News. "And they are nomads, so it's impossible to know where they are at any one time." Many of those Ayoreo who have moved out of the forest voluntarily have suffered appalling health problems, particularly from respiratory infections including tuberculosis. Their isolation leaves them with no natural immunity to such infections. Professor Lane said that the museum and its partners in the expedition had no interest in contacting isolated tribes during the trip. "We are targeting protected areas because, many areas of forest of the Chaco have already been cut down, so they are of little interest for a scientific expedition," he said. The museum plans to go ahead with the expedition and hopes that it will help "governments and conservation groups better understand how to manage fragile habitats and protect them for future generations".